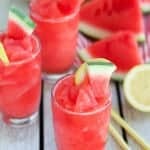 This simple two ingredient recipe combines frozen watermelon and lemonade for a delicious, refreshing frozen beverage! Process frozen watermelon and lemonade in a blender until combined. Add ice if you'd like it thicker, or more lemonade if you'd like if thinner. Serve immediately. Feel free to add alcohol for a spiked slushie.